One of the more intriguing things I have received as pasalubong is a bottle of Ras el Hanout from Morocco, compliments of my friend Nina. Ras El Hanout translates from the Arabic as head of the shop. It’s usually contains a varied blend of spices that differ from shop to shop. Each store boasts of their own unique blend, making it truly the head of that particular shop. Despite the variety, a typical ras el hanout can include cardamom, cloves, cinnamon, ground chili peppers, coriander, cumin, nutmeg, peppercorns and turmeric. Ras El Hanout, packaged ala Just Wandering. It’s a spice mix that I’ve never encountered before, not being familiar with Moroccan cuisine, so it had me scouring the net for recipe ideas. Nina’s pasalubong included a recipe card that suggested using it for spiced coffee. I immediately fell in love with the spiced coffee, so I got even more excited about using it for cooking. 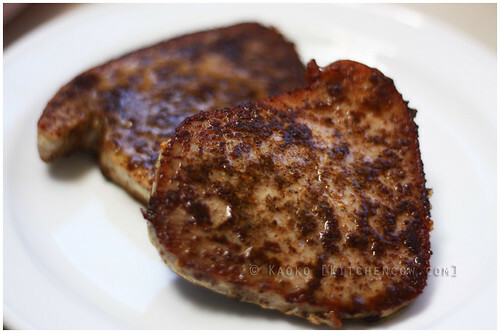 Used commonly as a spice rub for meats and fish, I decided to try it out on some lovely tuna steaks. 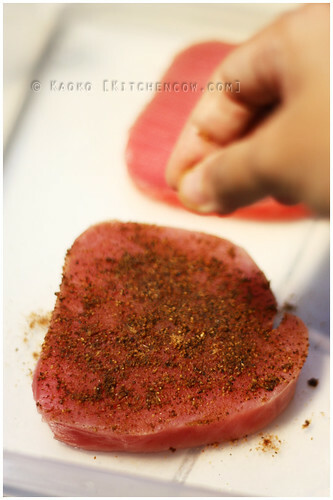 Making sure that the tuna steaks were clean and patted dry, I rubbed a generous helping of the spice on the steaks. I patted the spice well on both sides, before covering with cling wrap then refrigerating for an hour, to let the fish absorb the flavors. After the resting time, I simply heated butter in a pan (Oh fine, olive oil for the health-conscious!) then seared for 2-3 minutes each side. After taking it off the flame, I let it rest a bit before slicing. What we got was fish with intricate flavors, alternately smokey and pungent yet light. The tuna is naturally strong flavored, so I’d love to try this with something like tilapia or cream dory next time. Still, Ras El Hanout promises to be an interesting spice mix, so I’m looking forward to more experiments, maybe with meat. That is, if I don’t finish the jar all on my morning coffee. Wash and pat dry the tuna steaks. 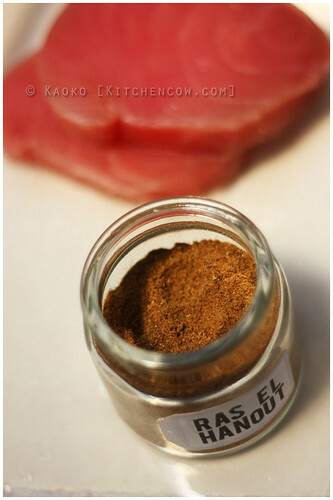 Rub with ras el hanout. Heat butter in pan. 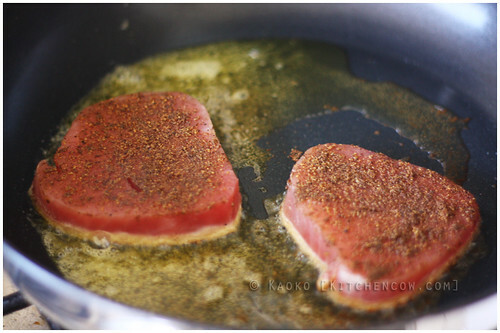 Sear tuna for 2-3 minutes on each side, depending on the thickness of the steaks. Let rest for a minute or so before slicing. Hmmm… Maybe I should buy spice. 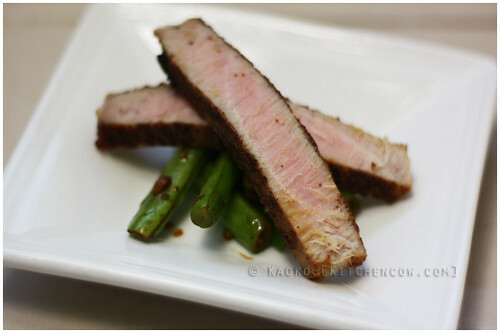 I pan-fried tuna last week and it turned out so bland. I just put lemon and salt. It’s the recipe for beef but I do practically the same for tuna. Yum! Been trying to find another use for ras el hanout aside from adding it to coffee — this looks easy enough to try for a kitchen amateur like me! Hahaha, mga adik sa spiced coffee! Hahahaha, matagal pa yun. I still have a lot of the bottle you gave. Thankies again! wow looks delicious! this inspires me to make a tuna dish tomorrow! I don’t know if it totally dissolves cause my coffee usually has a small amount of grit at the bottom from using a coffee press. But I think it disperses relatively well since you get so much flavor from just a pinch. This is interesting! I’m itching to try this one out.